Thank you to Nancy Elzig from Renee's Garden for the donation of seeds to Alameda School Garden Programs. 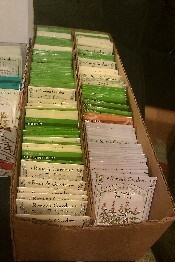 We are loving all the new varieties of seeds, and can't wait to watch them grow! Aaron Pratt, craftsman of Aaron's Rain Barrels (http://www.ne-design.net) donated two custom made rain barrels to help Bay Farm conserve water by collecting rainwater for garden use! Thank you Aaron!! A special thank you goes out to Linda Louie for her donations of soil, flowers, bulbs, seeds and butterflies as well as her time watering and weeding. Your volunteer time means the world to us and we could not be more appreciative! Thank you to the Colleen Low and Laura Zhou who not only paid for Miss Hester's new class garden bed, but helped Marla and Lorri put it together! Thank you to the Bay Farm Elementary PTA for providing the funding for our fabulous Outdoor Learning Center! With their ongoing financial support, each student at Bay Farm can spend time planting, harvesting, cooking and eating organic produce at school. The Outdoor Learning Center was started around 12 years ago by parent volunteers. Over time the garden beds and tools have broken or been vandalized. We are constantly repairing, amending and planting our gardens. If you have something you would like to donate to the garden, or would like to sponsor one of the below items, please contact Lorri Garrett, Marla Lee, or Sarah Karlson. If you want to donate something specifically for your child's class garden, just let us know. - Help with weeding and pruning. In honor of the 40th anniversary of Chez Panise, Bay Farm Elementary took part in Eating for Education campaign. E4E is a grassroots effort to create national awareness about school garden and school lunch programs. There were three restaurants that took part in Alameda: Pappo, BarCeluna and Angela's Bistro. A big thank you to all of them for helping support Bay Farm Elementary School's Outdoor Learning Center as well as Alameda High and Henry Haight's Garden Programs. See the article in the Alameda Patch about the event. Below please see some of the new supplies we were able to purchase with the money donated. On September 11th and 12th Bay Farm's own Cub Scouts came out in full force for a garden workday. At least 2 Dens and there families came to the K-1 gardens to build three new garden beds and remove some sod. By the end of the weekend they had made their mark! Thank you for all of your hard work! The slide show below shows the before and after pictures. A special thanks to Rak Bhalla for organizing the day! Cub Scouts Rule! McKenzie Taffe and Courtney Shepler invited Miss Lorri over to help plant their Fall garden. It was difficult pulling out the the beautiful cherry tomatoes, but there is now room for broccoli, carrots, spinach, beets, swiss chard, brussel sprouts, and celery to grow. The Rhubarb and Stevia needed a little TLC, but hopefully they will soon be happy too. It was a lovely and productive day. Thank you very much to the Taffe-Shepler Family for supporting the Bay Farm PTA. Emma Low and Miss Lorri planted beans, strawberries, flowers, carrots, watermelon, lemon sorrel, broccoli and a tomato on a sunny Sunday afternoon. Thank you to the Low family for supporting Bay Farm School. Caila Devlin and her sister, Morgan, spent a rainy Wednesday afternoon with Miss. Lorri. They planted a miniature Bay Farm Garden with lemon sorrel, broccoli, parsley and radishes. Hopefully they will share some of the tomatoes from the 4 plants that we planted. Thank you to the Devlin Family for supporting Bay Farm Elementary!